Sarah Banks is a Fertility Coach and mentor who works with patients and clinics to offer coaching and emotional support. She also works with Fertility Professionals to enhance their patient's experience by helping them create a strong emotional support service. ​Sarah set up and runs two online Fertility support communities, regularly supporting over 700 patients, and hosts two local support groups to provide emotional support for those in need. 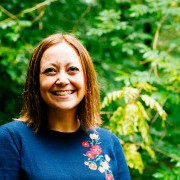 Through her work with fertility clients, and her own personal IVF journey, she has a deep understanding of the impact to emotional and mental health that infertility causes, and the support that is needed.